This work is based on the proceedings of the American Institute of Chemical Engineers' Spring National Meeting in Houston, Texas, March 28 to April 1, 1993. It details various facets of residue upgrading and distillate hydrotreating, stressing the importance of selective catalysts in aromatics reduction. New aromatics saturation processes for the production of very low-aromatic distillates are introduced. 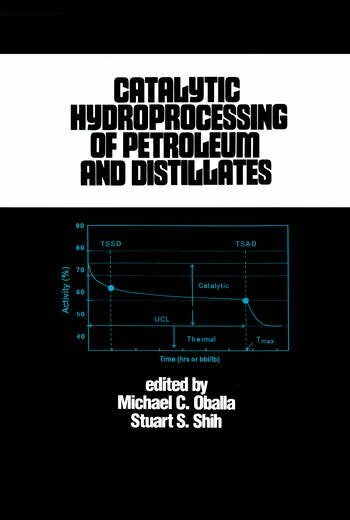 Part 1: Catalyst Deactivation: Catalyst Deactivation in Hydrotreating of Residua - A Review * Catalyst Deactivation in Residue Hydrocracking. Part 2 Upgrading of Heavy Oils and Residue: Resid Hydrocracking - New Frontiers * Upgrading of a Moroccan Deasphalted Shale Oil Over Mechanical Mixtures of Sulfided Cobalt-Molybdenum and Nickel-Molybdenum Alumina Supported Catalysts * Rapid Hydropyrolysis of Resid Oil * Residue Upgrading by Hydrovisbreaking and Hydrotreating * Mild Hydrocracking of Heavy Oils with Modified Alumina Based Catalysts * Residuum Upgrading by High Pressure Slurry Phase Technology - Technical, Economic and Environmental Aspects * Fate of Asphaltenes During Hydroprocessing of Heavy Petroleum Residues * Catalyst Poisoning During Tar-Sands Bitumen Upgrading * Comparison of Unimodal Versus Bi-modal Pore Catalysis in Residues Hydrotreating * A Study of Aluminophosphate Supported Ni-Mo Catalysts for Hydrocracking Bitumen. Part 3 Hydrotreating of Distillates: Two-Stage Hydrotreating of Bitumen-Derived Middle Distillates to Produce Diesel and Jet Fuels, and Kinetics of Aromatics Hydrogenation * Aromatics Saturation Over Hydrotreating Catalysts - Reactivity and Susceptibility to Poisons * Production of Swedish Class 1 Diesel Using Dual-Stage Process * Shell Middle Distillate Hydrogenation Process * A Comparative Study of Catalysts for the Deep Aromatic Reduction in Hydrotreated Gas Oil * Unionfining - Technical Case Studies * Effect of H2S on the Functionalities of a CoMo/Al2O3, Hydrotreating Catalyst. Part 4 General Papers: New Hydroprocessing Catatysts Prepared from Molecular Complexes * Fluidized Catalytic Cracking of Hydrotreated Charge Stock for Naphtha Sulfur Reduction * Hydrocracking Phenanthrene and 1-Methyl Naphthalene - Development of Linear-Free Energy Relationships * A Novel Process for Upgrading Heavy Oil Emulsions * Hydroconversion of Methyl-Cyclohexane on a Bifunctional Catalyst. ". . .an attractive compilation of current work that gives a useful snapshot of the current state of the art in refinery practice and in laboratory research. "